While the world of politics was talking about President Obama's recent meetings with Hu Jintao, I noticed what the FLOTUS (First Lady of the United States) wore to the state dinner. She wore a gorgeous red print Alexander McQueen gown. When I first saw that she was wearing McQueen, I was a little shocked, since some of the line's recent patterns have featured skulls or snake print. But the dress was a very tasteful floral print, she looked great. 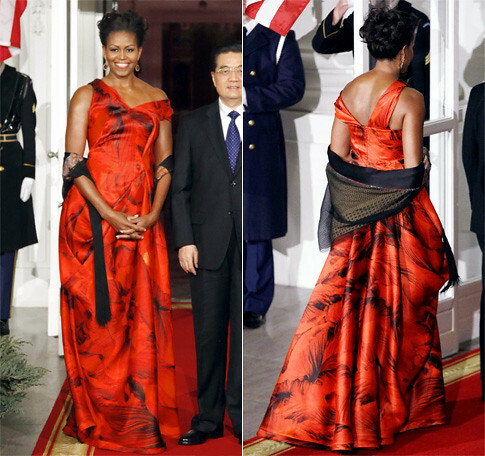 Of course, since nothing the Obamas do can go without criticism, the FLOTUS did receive some flak for her choice to wear McQueen. Oscar de la Renta criticized her for wearing a British designer to an event meant to promote trade between China and the US. While I understand his argument, I think it's a little misplaced. Mrs. Obama has done a lot for both American fashion and fashion newcomers. She helped make start up designers like Jason Wu and Prabal Gurung famous and is largely credited with helping to restore two major American retail labels, J.Crew and White House | Black Market. It's not as though she never wears American designers. Even just within the past few weeks, she has worn Narciso Rodriguez and Thakoon. She has also worn Derek Lam, Rachel Roy and Peter Soronen, all American designers, in past state dinners. So, I think de la Renta's argument is a poorly defended.